Marvel Super Heroes Gift Set 3-Pack! Captain America and his dynamic team battle for good with the secrets in their shields! their shields! This 2nd series release, while a tough find-is not as tough to find as the 1st series multi-packs. 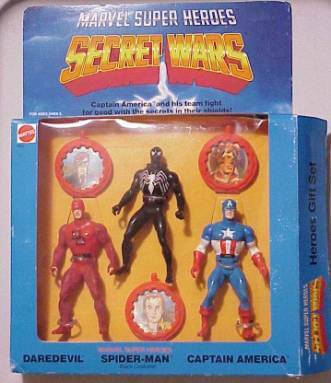 A very neat 3-pack that is unique among Secret Wars items. It is the only item that I know of that features the European figures on the back. It is also the only item that has figures in a window box. All the other items come on a blister card or bagged in a box. I can’t say enough about the coolness of the multi-packs, maybe it’s just that they’re so much more difficult to find than any of the carded figures. Regardless, if you come across multi-packs, they’re worth picking up in any condition.